A Step In The Journey — A blog about crafting, cooking, living, and believing. Y’all that Halloween hangover is real. The night itself was so much fun and the kids were the cutest all dressed up (I’ll share pictures soon!) We made the most of their costumes with Halloween parties at dance, preschool, and Daddy’s work. We also went to Trunk or Treat at the church and then our neighborhood party before Trick or Treating! These events spanned over the course of a week and I’m exhausted. It will be nice to get back into a normal routine next week! 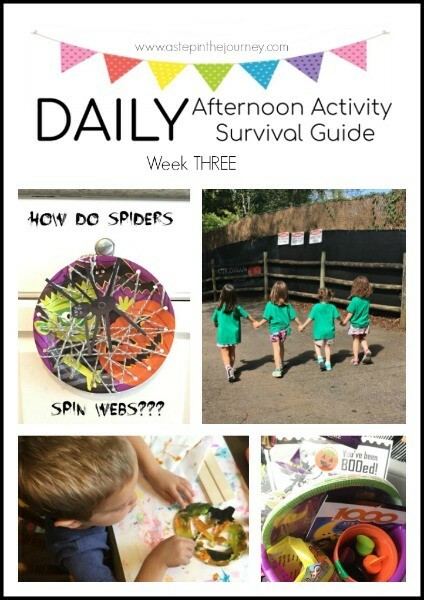 If you would like a copy of the daily afternoon survival activities you can check it out here! I can’t believe we haven’t made this yet, but on tap for Monday is 100 Days of Real Food’s pumpkin bread. It is amazing & my littles eat it up! Check out the recipe here (I turned them into muffins!). Teach your kiddos about the first Thanksgiving. How Thanksgiving is about being grateful for friends, gathering around the table, and remembering all of the other blessings the Lord has placed in your life. Here are a few books that we are reading. Scavenger hunts are one of our favorite ways to spice up a walk, especially in this beautiful FALL weather! Ours are never fancy. “Nature” is our theme, so I had the kids brainstorm things we might find or see in nature as we walked around the neighborhood. Some of the things they came up with are leaves, bird, pumpkin, rocks, trees, bugs, ants, and pine cones. 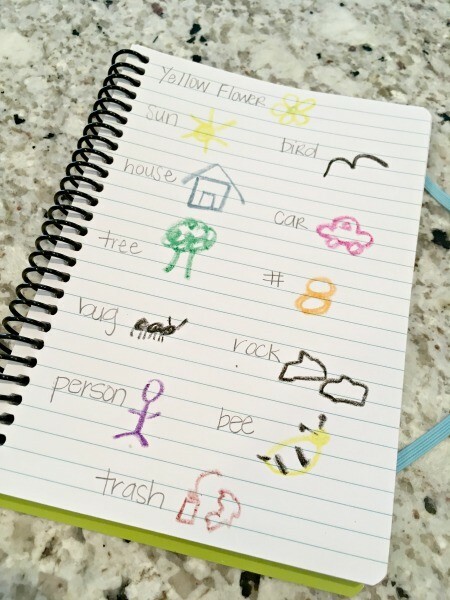 Then I created a list by drawing a quick picture and writing the word. This way they could “read” the items. To lengthen the activity instead of just finding each item we talked about tally marks and they counted how many of each item they found. A Thankful Turkey. The concept is simple. 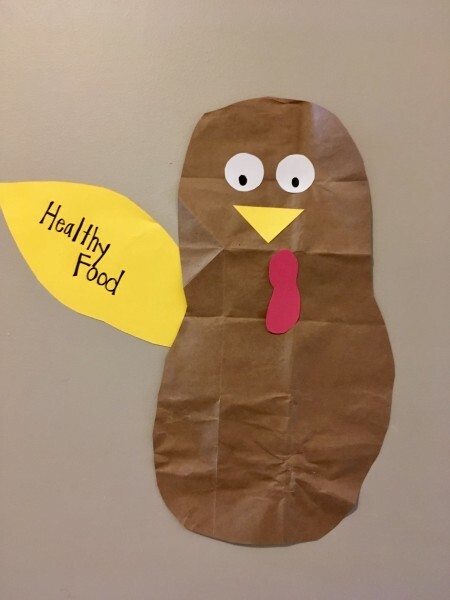 Cut out a turkey body from a grocery paper bag. Pre-cut a bunch of paper feathers. Each day take turns or decide as a unit something we are thankful for. Write it on a feather and add to the turkey. By Thanksgiving you will have quite a fluffy feather & hopefully your kids will have BIG thankful hearts! Yesterday, they said they were thankful for good food that helps them grow. I’m sure today it will be for their magna-tiles, but this mama will take what she can get! Just let them play! It’s Friday….the weekend is coming. We are watching Cinderella this Friday and eating pizza and maybe even letting them eat TWO pieces of Halloween candy. All of the Halloween festivities are in FULL swing over here! So far Chickadee has gone in costume to ballet class, we all ventured out to Trunk or Treat at church & we just got back from a HUGE Halloween event put on by III’s company. And there is still almost a week until Halloween! So much fun has been had. 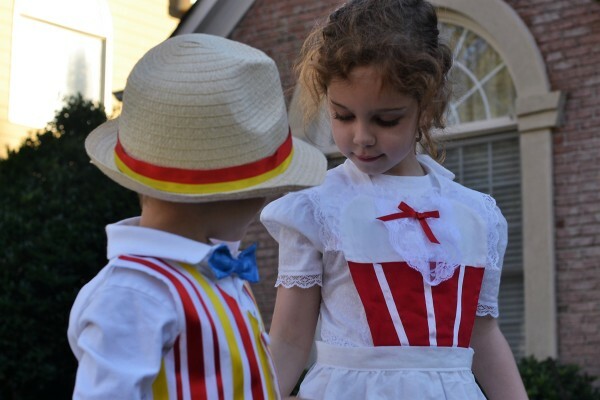 Have your kids decided what they want to be for Halloween?? I’ll be sharing our pictures next week! Next week we will keep up some of the fall/Halloween fun with our daily activities! On Monday we are going to either paint or carve pumpkins! I haven’t decided which one yet, but we’ve had pumpkins sitting on the front porch since the beginning of October just begging us to add our personal touch. I’ve carved pumpkins with the littles before and it is important to remember, safety first! They LOVE the sensory activity of scooping out all of the seeds. They use both their hands and plastic spoons. 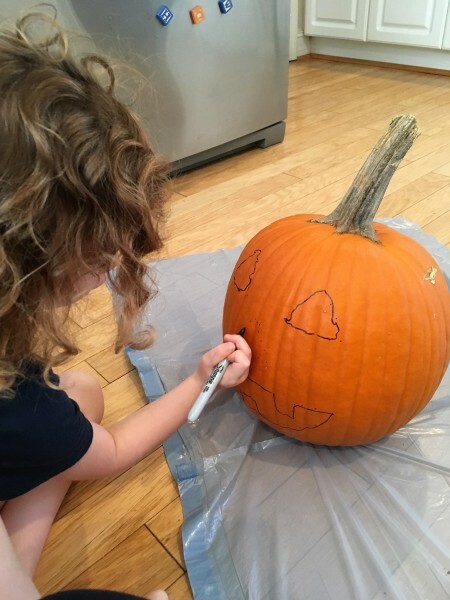 I then have them use a sharpie to “sketch” their pumpkin face before I cut it out. 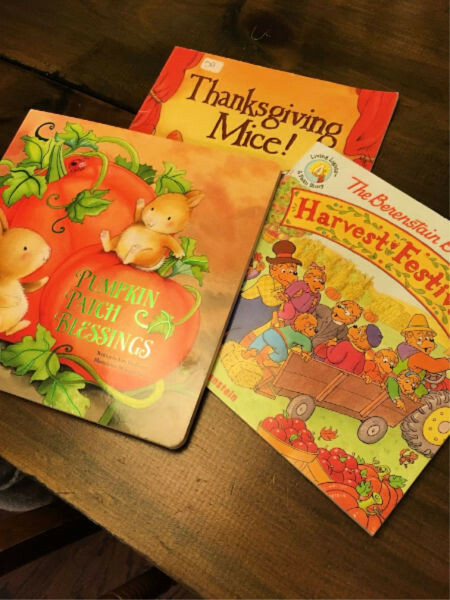 Teach It Tuesday this week is a Hallo-read-a-thon! 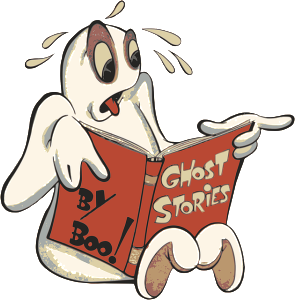 Pull out ALL of those Halloween books or swing by the library and then read, read, read. The kids love both being read to and reading on their own. It takes time to build up reading stamina. If your little one isn’t the biggest fan of “reading” or looking at books independently yet, I suggest using a timer and starting with a small amount of time, 3-5 minutes. Have them look at the pictures and/or words and read until the timer goes off. Build this time up over time. We worked on building stamina for a while and no my kids could look at books for hours! Happy Halloween!! Our neighborhood has a HUGE Halloween party with bounce houses, face painting, costume contests, pizza and a toddler corn table. It is so much fun for the kids. And then trick or treating…oh, the trick or treating!! We gave away between 400-500 pieces of candy last year. And I think the kids like passing out the candy more than actually going trick or treating. We are making the sweetest memories! So our Wander there Wednesday is going trick or treating! However, if you need a little something earlier in the day, check out this Halloween scavenger hunt! We are going to walk around the neighborhood to look at decorations (again!) and see what all we can find! Make dinner for a friend! We were sooo blessed after each of our babies by friends who brought dinner those first few months. So whenever we have a friend with a new baby we always sign up to take them a meal! And the kids are a part of it. 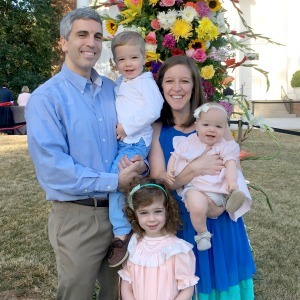 I want to instill loving your neighbor in the heart of my children and this is one tangible way in which I can do this. Sometimes it’s not a new baby, but a family who has a little extra on their plate. We are part of a foster care family support group and this Thursday we are making dinner for a foster mom so that she has one less thing to worry about when everyone gets home for dinner! So whether it’s dinner or whipping up some cookies and passing them out to friends, get in the kitchen and brighten someone’s day with a culinary gift. I am heading out of town this weekend for a GIRL’S weekend. Wahoo! So as of 3:00 Mama is off duty until Sunday afternoon (if you can ever really be off duty as a parent???). III will be wrangling all three solo for pizza and a movie night, and I have no doubt they will have a blast. He’s a rock star dad! Today is Chickadee’s 5th birthday. Yall, how can that even be?? 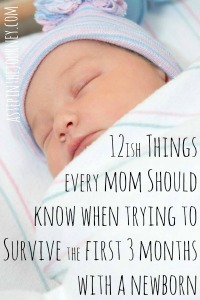 I feel like just made me a mama yesterday…while at the same time surviving those first three months feels like a lifetime ago. We are celebrating with a pancakes, princesses & pajamas party with some of her favorite 4 and 5 year old little girls. I can’t wait! She LOVES celebrating folks and is beyond excited that it is her turn! This will be the last FULL week of October, so we are going to live up all things pumpkin (although let’s be honest, we are going to ride the pumpkin train through November too!) 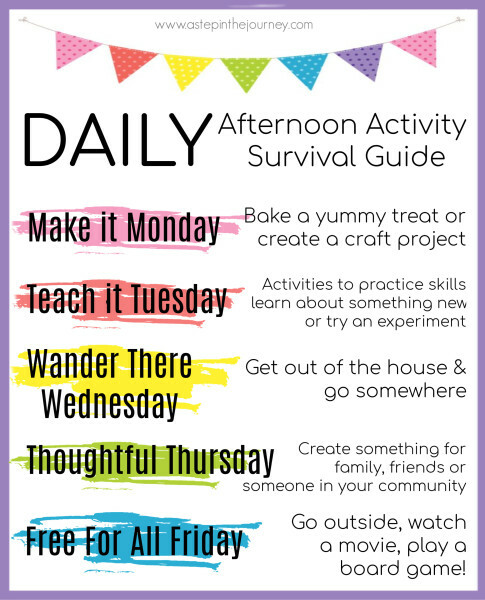 If you would like a copy of the daily afternoon survival activities you can check it out here! See below for this week’s afternoon toddler activities. While we were on Whole 30 we cheated a little by eating the most AMAZING Almond Banana Muffins. 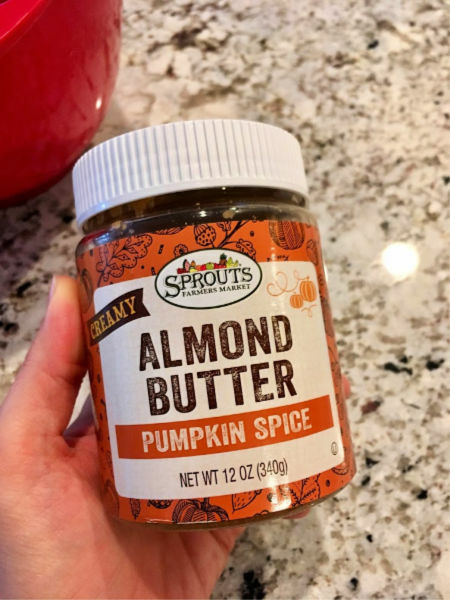 It’s cheating because they say muffins are a bad habit and while all the ingredients are Whole 30 compliant, you are more likely to go back to eating “bad for you muffins” if you didn’t really kick the habit while on Whole 30. Anyways…they were amazing and yes we are eating muffins, but they are whole and clean and I don’t fell one iota bad for eating them! I found the recipe on Hustle and Heart Fitness, and it’s perfection. The kids agree. 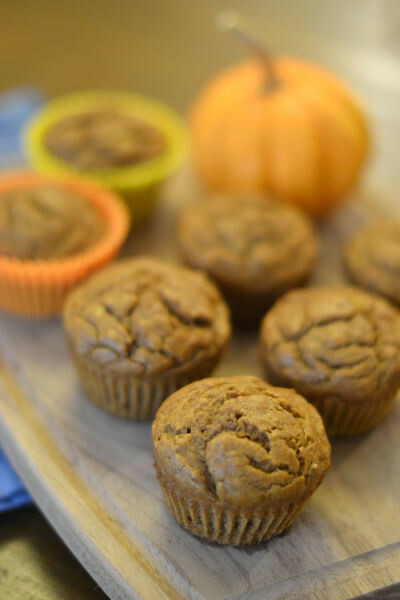 And the only thing that made these muffins even better….PUMPKIN SPICE Almond Butter. Yes, you read that right. I love having muffins around to go with breakfast or for the kids to eat for a snack. My one almond butter tip…leave it in the fridge upside down. The oil settles to the top, so if upside, it settles to the bottom! Win. And make sure it’s been in the fridge before you make this recipe. The muffins come out fluffier! 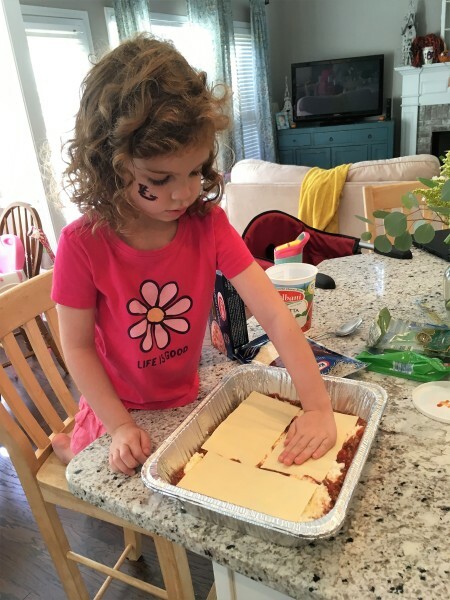 Sometimes on Teach It Tuesday we all do the same thing, sometimes the kids to different things, and other times it’s the same activity but working on a different skill. That is what we have going on here & it’s great because you can adjust it to create the perfect activity for your toddler. Essentially you creating a matching game. I use this craft paper that goes with our easel and post its. 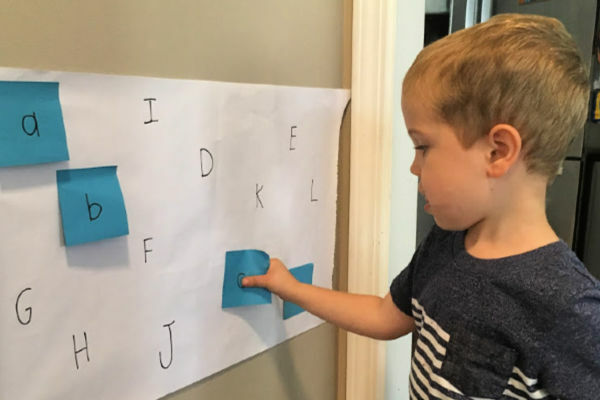 Sprout is working on his letters, so he matched a stack of lower case letters (on the sticky notes) with the upper case letters on the craft paper. Chickadee practiced adding by solving the problem on the sticky note and matching it to the answer on the craft paper. 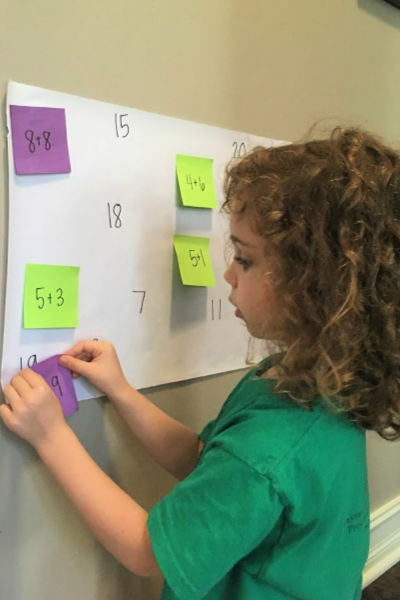 Some other ideas would be subtraction, matching a picture on a post it with the word on the craft paper, number words to digits, 8 dots to the number 8…I’d love to hear any other ideas you have! My kids LOVED this and actually asked to do it again after round one and then again the next day! If you aren’t taking your kids to the library, you are missing out on some free, tax payer dollar FUN! My kids LOVE looking through books on the shelves, playing with the puzzles in the kid’s area, and we really like toddler time. Our library’s toddler time is on Wednesday (which works out!). I am sure your library has a toddler time as well. The library is right across the street from the duck pond, so on nice days we almost always walk around there before or after the library! I saw on Instastories this great idea from Elisabeth Hasselbeck for encouraging and sharing some love with your friends. 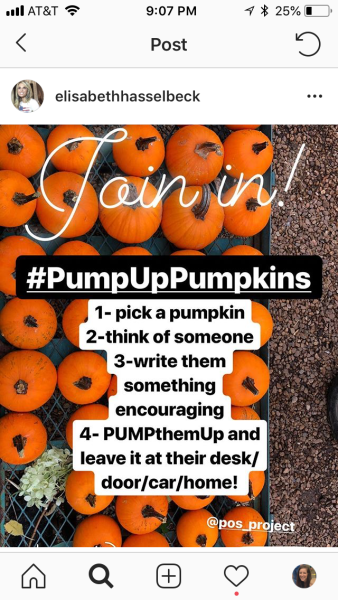 The premise is simple: buy pumkins, write a note on the pumpkin (or draw a picture), then leave it for your friend/neighbor/grandmama/cousin to find! 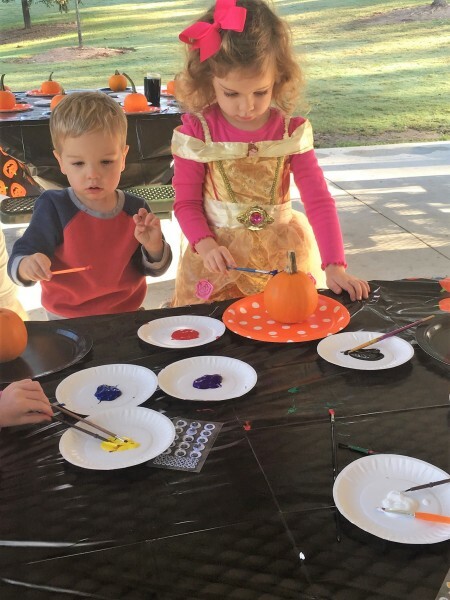 The kids loved decorating the pumpkins and then participating in a stealth delivery! Who could your kids encourage and share the love with today? Is there anymore more classic than The Great Pumpkin Charlie Brown? We had to introduce our kiddos, and of course we ate pizza! In an effort to add to my Whole 30 recipe inventory I am sharing another recipe with you that is EASY and compliant. 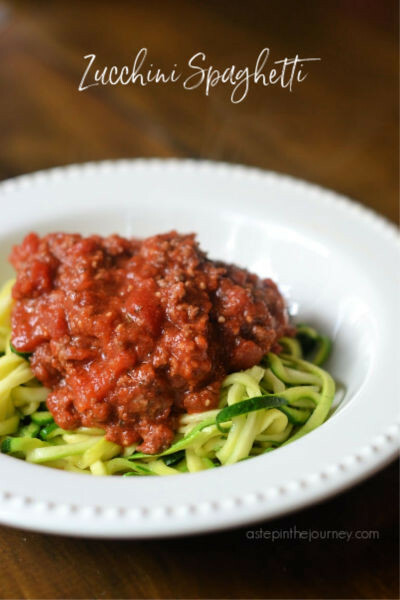 This zucchini spaghetti has actually made it into our meal planning rotation now that we are not on Whole 30 because it is so good and makes great leftovers. If you want to read more about the most amazing & simple meal planning strategy, check out this post where I tell you how I take the stress out of meal planning. 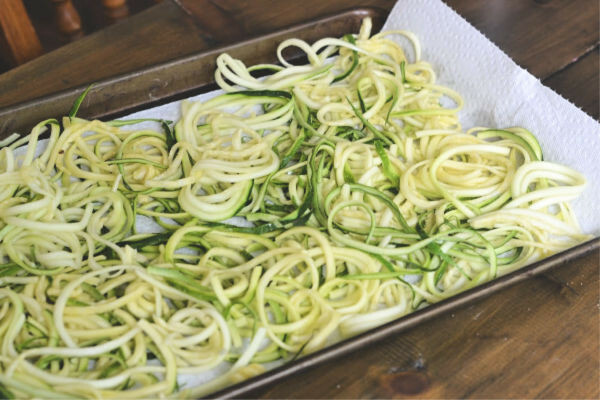 So I think the technical or culinary term for zucchini noodles would be zoodles and they have become so popular, that if you don’t want to spiralize your own, you can find them in the produce department or the frozen aisle of most grocery stores. But I suggest spiralizing because it’s cheaper and really easy! I use this handheld spiralizer my mom bought me a few years back, but they also have big fancy ones or attachments for your Kitchen Aid mixer if you want to go that route. 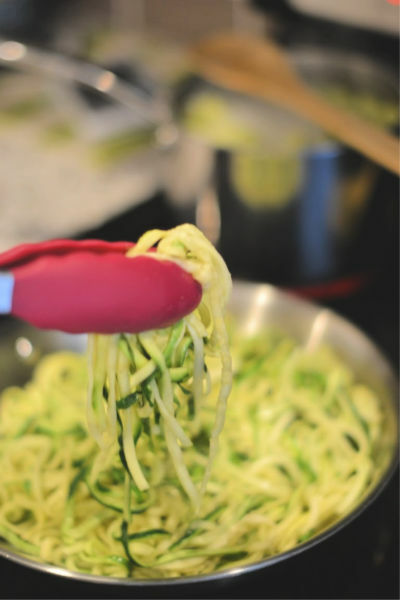 You will want to “sweat” your zoodles (I spiralize one zucchini per person or double if trying to have leftovers! ), so I like to spiralize right onto a baking sheet lined with paper towels. I don’t usually peel my zucchini, but lots of folks do so try it both ways and decide on your preference for future zoodling! Season them with salt and then place in the oven on 200 degrees for about 30 minutes! Once they are finished take another paper towel squeeze out any remaining water by pushing down from the top. Sweating your zoodles will make your final dish a lot less liquidy since zucchini hold a lot of water when they are raw. You can either saute your zoodles in a little avocado oil for 5-6 minutes or throw them in your meat sauce while it is simmering about let them soften that way (about 10 minutes). While the zoodles are sweating, now is the time to prepare your meat sauce. If I am not on Whole 30 I will sometimes used an organic & sugar free marina sauce with these meatballs. YUM! But if we are sticking to Whole 30 we want to make sure our meat sauce is compliant. Check out the full recipe for that below. 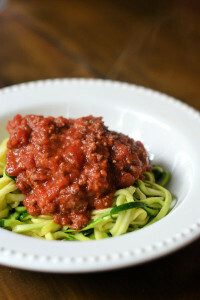 A simple Whole 30 dinner of zucchini noodles and meat sauce. Prepare zoodles according to directions above...spiral, sweat, squeeze. While the zoodles are sweating prepare your sauce. In a large pan over medium heat drizzle your oil. Then saute your onions until soft (about 3-4 minutes). Add minced/chopped garlic and cook until fragrant. Then add ground beef. Cook until brown throughout. Add remaining ingredients (diced tomatoes, spaghetti sauce & seasonings) and bring to a slight boil. Then turn your heat to low and let simmer for 15-20 minutes. You can cook your zoodles one of two ways. First, after sweating them you can saute in batches using a little olive oil for about 5 minutes or until they reach your desired tenderness. Another option is to throw them in with the meat sauce and let them simmer for about 10 minutes. As a quick FYI, these don’t taste just like regular pasta noodles. You can’t go into trying this dish thinking you won’t notice a difference from traditional spaghetti. However, zoodles are a great healthy replacement and this dinner is delicious, heavy on the veggies, and I promise you will feel so much better after eating zucchini spaghetti for dinner than carb loaded pasta! ENJOY! Week 3 is here, and so are cooler temperatures down south. Wahoo! Did you try the smoothie popsicles?? They were a hit all week with my little ones. We even ate them for breakfast! 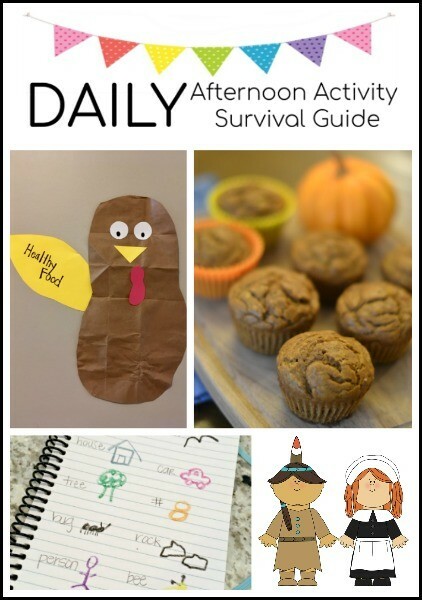 If you would like a copy of the daily afternoon survival activities you can check it out here! You can find week’s ONE and TWO linked at the bottom! Feel free to jump in anytime. I’m excited to be building this library of ideas that I will be able to continue to pull from year after year! As we are getting closer to Halloween, this week we are embracing all things pumpkin, orange, & friendly/spooky fun! 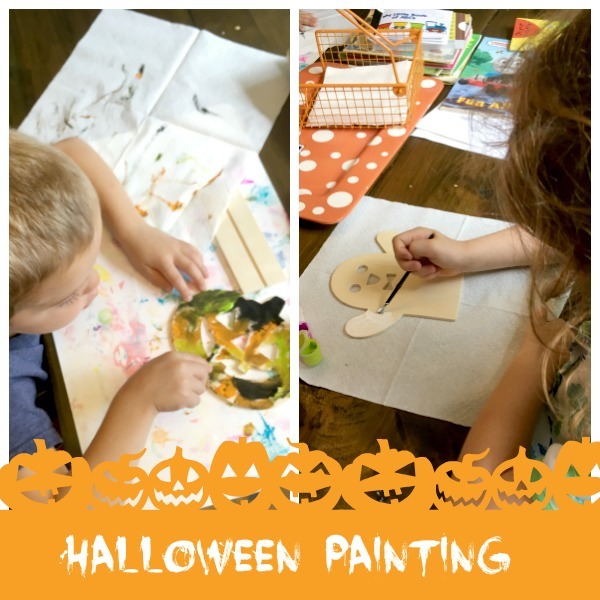 As I mentioned last week, Target is helping us out with our Make It Monday (however, you can find fun Halloween painting kits at most craft stores too. I grabbed a wooden die-cut of a pumpkin and ghost at Target a few weeks back. We LOVE painting around here and so I didn’t want to miss an opportunity to brake out the paintbrushes. I always have the kids use the back of their placemats when working on small projects and use the cheapo plastic brushes so they don’t have to mix colors. Although sometimes they do and that is just fine! When leaving the neighborhood last weekend we saw a huge spider web that went from a fire hydrant, UP to a street sign. The kids were amazed by the beautiful creation and started asking all kinds of questions about spiders and how the spin their webs. So following their cue Tuesday was all about spiders. 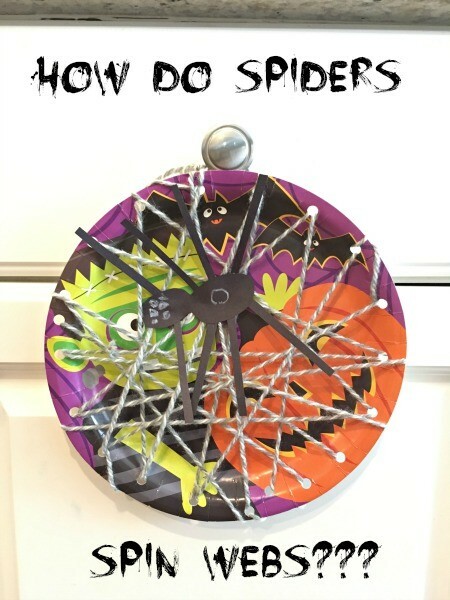 Click here to see what we talked about, a cute video we watched, the adventure we went on and for a simple tutorial on how we created our own webs. This week we went to the ZOO with Chickadee’s preschool class. 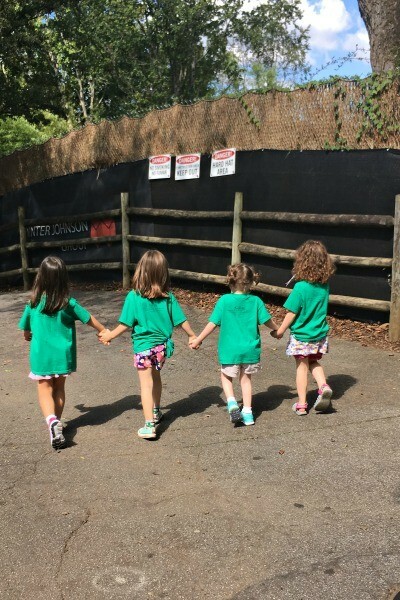 It was so much fun to experience the zoo with her sweet group of preschool friends. The Atlanta Zoo is wonderful. It’s super shady, has awesome animals, a train, splash pad, playground and carousel. We are members and find ourselves venturing down there quite a bit! 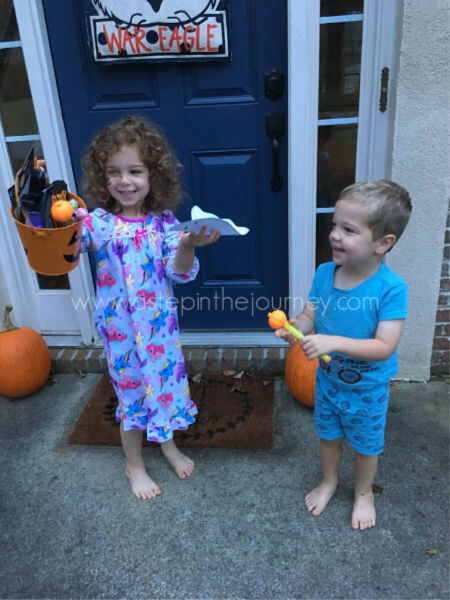 Staying in our Halloween theme for the week, this week for Thoughtful Thursday we BOO’d our neighbors! What is “Boo-ing” you may ask? Well it was new to me too when we moved into our neighborhood. 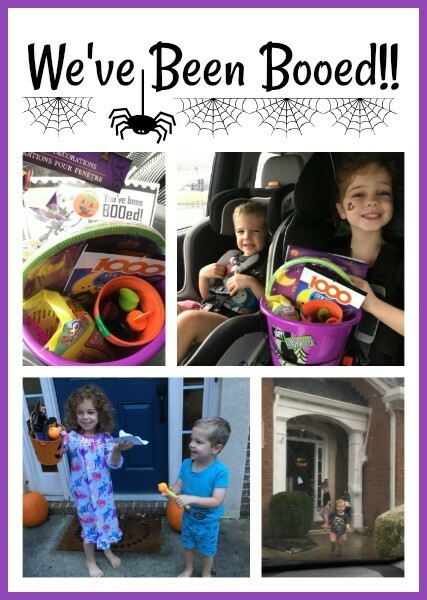 But here is the gist…fill a bucket with awesome treats and Halloween goodies. Then secretly deliver it to a neighbor, leaving a paper ghost on their door, and directions to pass a new boo bucket along to someone else in the next 48 hours. Eventually it works it’s way ALL around the neighborhood and everyone gets to be in on the FUN! It worked out perfectly that we were boo’d on Tuesday night. Thursday we headed to the Dollar Tree to grab lots of goodies for one of our friends that is new to our neighborhood. Then the kids being as stealthy as a 3 and 4 year old could be left the bucked of goodies on their porch along with the ghost on their door! SO. MUCH. FUN. We drew our own ghost but there are lots of blogs out their with super cute printables! We headed out of town on Friday afternoon. But first we ran by the library to grab some new movies. We try to limit our screen time day in and day out, but when we travel…give me all the movies! Watching Charlotte’s Web might be fun if you talked about spiders on Tuesday! I hope you are able to implement some of these activities with your little one next week! I’d love to see pictures of your kiddos enjoying and you surviving your afternoons. 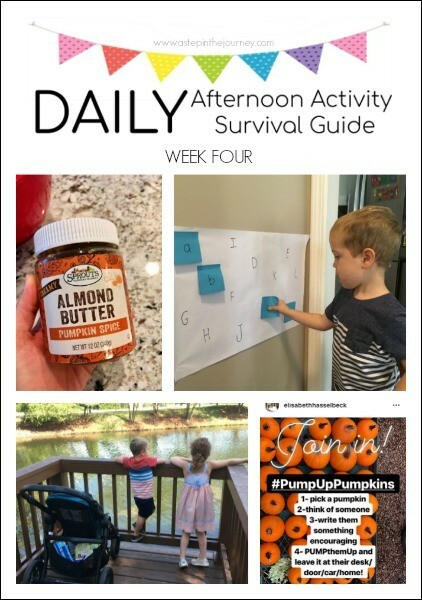 Tag @astepinthejourney or use the hashtag #kiddosurvivalguide if you share on instagram or Facebook!